Florida’s demographics are shifting. But it’s not turning the state completely blue. Florida’s primaries are setting up some of the most hotly contested races this year. But already Democrats are worried the so-called Democratic “blue wave” could stop short of Florida’s shores. Republican Rick Scott is challenging the state’s incumbent Democratic Sen. Bill Nelson’s reelection bid. Scott is a pretty popular two-term governor who has been polling in the lead. The governor’s race is looking like it will be a toss-up between a Trump-lite Republican Rep. Ron DeSantis and center-left former Rep. Gwen Graham. And the six most competitive House races in the state either lean Republican or are likely to be held by Republicans, according to the nonpartisan Cook Political Report. Florida has always had a reputation of being hard to predict; the nation’s largest swing-state has decided presidential elections with less than 2-point margins of victory. 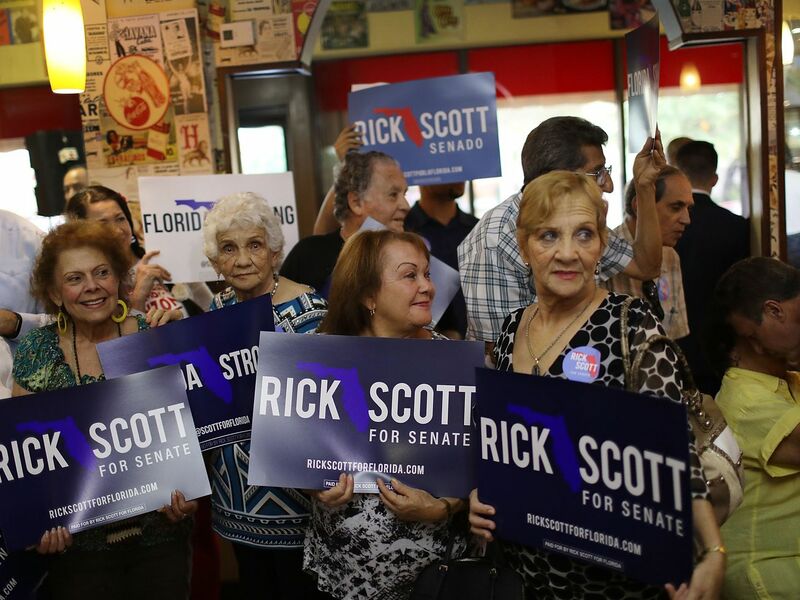 But while more people disapprove of President Donald Trump than approve in almost every single swing state that proved crucial to his 2016 victory, Florida remains a notable exception. Nationwide, Democrats are trying to harness Trump’s unpopularity to drive historic numbers of voters to the polls and change the political makeup of Washington. But Florida remains bullish on Trump, spelling trouble for the Democrats this coming fall. While substantially less popular a year and a half into his presidency than when he initially took office, and his popularity in the Midwest completely deflated, Trump remains strong in the Sunshine State. 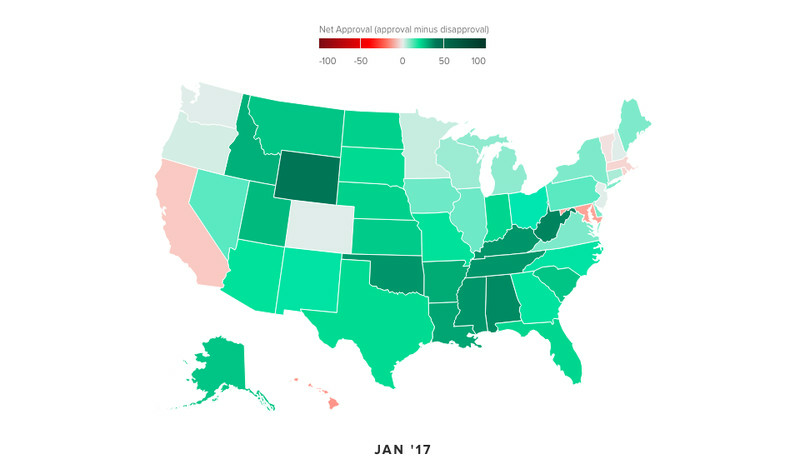 Trump’s state-by-state approval rating has dropped significantly over the past year and a half. In January 2017 he had a net-positive approval rating in almost every state in the country, except California, Massachusetts, Vermont, and Rhodes Island. That’s far from the case now. Morning Consult has been tracking Trump’s net-approval rating (the percentage of approval minus the percentage of disapproval) since he took office. Here’s what the map looked like as of June 2018; the states shaded green are where more people approved than disapproved of Trump, and those tinted red are where more disapproved of the president than approved of him. 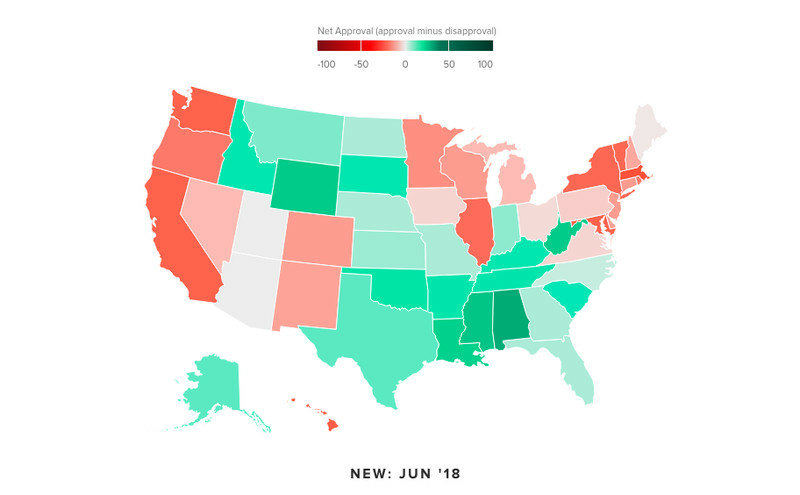 Trump’s net-approval rating by state in June 2018. As you can see, Trump is currently polling better in Florida than he is in Arizona, Iowa, Ohio, Wisconsin, Pennsylvania, Michigan, Utah, Nevada, or North Carolina (all states that proved crucial to his 2016 presidential win). Trump’s net-approval rating by state in January 2017. The difference is striking — and really important to consider before the 2018 midterm elections. Trump and the presidency may not be on the ballot, but his record and endorsements are. And Democrats have a lot of ground to gain in Florida if they want to reshape the country’s power dynamics. Democrats hoped the state’s changing demographics would help them. Maybe not. When tens of thousands of Puerto Ricans fled to the state after the devastating Hurricane Maria hit, Democrats hoped the new residents would turn the purple-state blue. But that looks increasingly like wishful thinking. Depending on who you ask, somewhere between 50,000 and 300,000 people fled to Florida after the hurricane. Take into account people’s ages and how likely they are to even vote, and the New York Times’ Nate Cohn says the influx of new Floridian’s could maybe sway the results by half of a percentage point. For all the hype about Puerto Ricans moving to the Sunshine State after Hurricane Maria, or high school students like the Parkland gun control activists turning 18 and registering to vote, any Democratic surge could be offset by the migration of Republican-leaning seniors who like Florida’s balmy weather and lack of income tax. This read is consistent with recent polling that’s shown Scott consistently lead over Nelson in Florida by a couple points. But it’s not all bad news for Democrats. Trump’s lack of popularity in Pennsylvania, Wisconsin, and Michigan, and his decreasing popularity in states like Missouri could prove critical to the Democrats’ gaining more power in November. It won’t be an easy election for Democrats, but enthusiasm appears to be on their side. Is There A Need For New Faces? How old is Gerard Depardieu, what are his most famous films and who is his partner Clementine Igou?